A major strand of my research on service-learning in higher education found that there is a shallow institutionalization of community engagement; a notion of service-learning as “a mile wide and an inch deep,” or what I have termed an “engagement ceiling.” My research has thus focused on ways to institutionalize service-learning in powerful and sustainable ways, with academic programs – such as certificates, minors, and majors – at the heart of this vision for the deep institutionalization of civic and community engagement in higher education. These programs demonstrate that there are conceptually rigorous and practically feasible means by which to create sustained, sequential, and scaffolded academic programs that support students’ habits of mind and repertoires of action towards becoming thoughtful and engaged citizens within a complex and pluralistic democracy. The following academic work provides some of the key texts that serve as an impetus, synthesis, and elaboration on this research. Please see my CV or Academia.edu page for a full listing of my academic research, talks, workshops, and general audience writings on this issue. Dan Butin. 2006. “The Limits of Service-Learning in Higher Education”, The Review of Higher Education, 29(4). Pp. 473-498. Dan Butin. 2006. “Disciplining Service-Learning: Institutionalization and the Case for Community Studies”, International Journal of Teaching and Learning in Higher Education, 18(1). Pp. 57-64. Dan Butin. 2010. 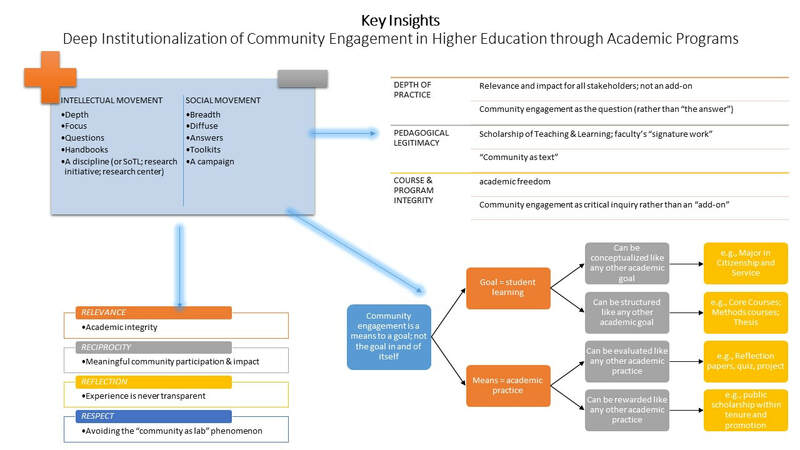 Service-Learning in Theory and Practice: The Future of Community Engagement in Higher Education. NY: Palgrave. Dan Butin. 2010. “Can I Major in Service-Learning? An Empirical Analysis of Majors, Minors, and Certificates”, Journal of College and Character, 11(2). Pp. 1-19. Dan Butin. 2012. “When Engagement is Not Enough: Building the Next Generation of the Engaged Campus.” In D. Butin and S. Seider (editors) The Engaged Campus: Majors, Minors and Certificates as the New Community Engagement. Pp. 1-14. NY: Palgrave. The list below is an updated (as of September, 2017) and working list that combines research done by Dan Sarofian-Butin, programs’ own “self-declaration," and the work of a group of graduate students -- Lyena Chavez, Emily McCaffrey, Elsabel Rincon, and Brian Shea -- as part of a course (Theories of Organizational Change) that I taught in the summer of 2017. Please email me (SarofianButD@merrimack.edu) for additional information or to update the list of academic programs. 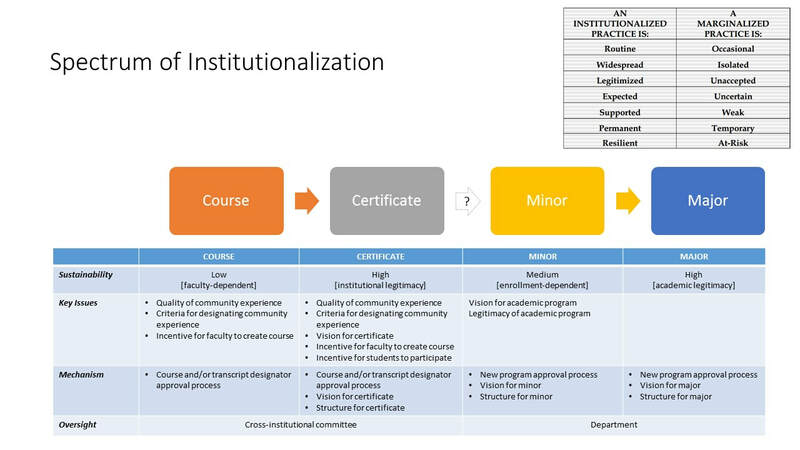 Below are two slides that I use to talk about the context -- conceptual, pedagogical, and organizational -- for the role of academic programs in institutionalizing community engagement in higher education.